The popular temporary file cleaner CCleaner has just been updated by the developing company Piriform. The latest iteration of CCleaner brings support for the first Windows 7 Service Pack, Internet Explorer user data cleaning, management and more. The program is still provided as a portable version and installer, which both offer the same features and cleaning options. The interface has not changed at all, and some users may find it hard to spot any differences to previous versions of the software. If they look at the individual cleaning options they find additional options for programs that were not supported in previous versions of the application, provided that they are installed. Included in CCleaner 3.04 are among others support for FeedDemon, Free Download Manager, Internet Download Manager and Comodo Dragon. In addition, support has been added for Thunderbird's and SongBird's embedded browser and Opera's Icon Cache folder. The detection of temporary files for programs like AVG Antivirus, Windows Media Player and Google Chrome has been improved as well. 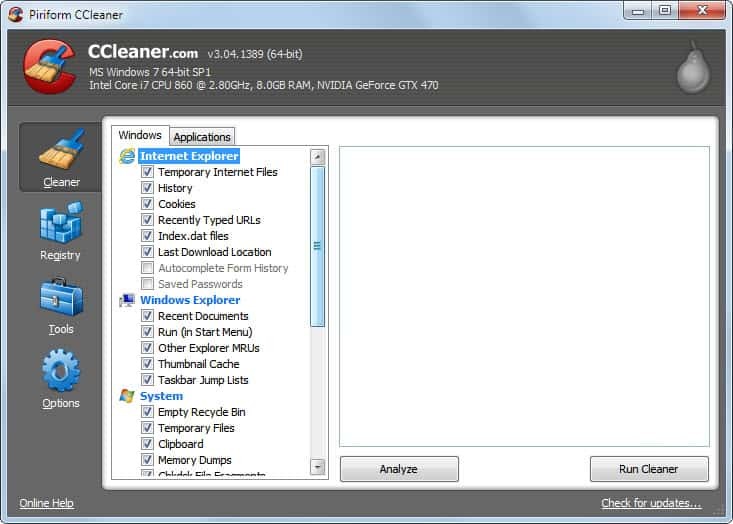 Both a 32-bit and 64-bit edition are supplied with CCleaner, regardless if the user downloads the installer or portable version. CCleaner 3.04 can be downloaded from the developer website over at Piriform. Check out the guide How To Install And Use CCleaner and the third party tool CCleaner Enhancer which adds support for more than 200 programs to CCleaner. Just add CCleaner Enhancher which adds 270+ cleaning rules. I advise to uncheck that in settings if you use Opera.